Simple form of expression in a reserved style. Light and finely polished, Mazurka boasts a clean and aesthetic design. 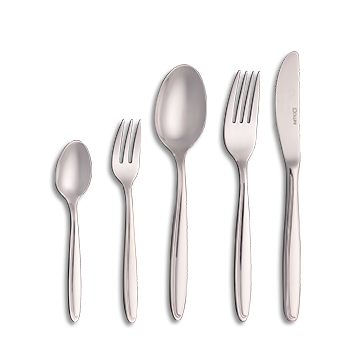 With smooth, matt handles and straight, flat basic design elements, this impressive set of cutlery boasts sensual refinement and considerable expressiveness. The discreet relief which envelopes half of the handle emphasises its distinctiveness. A modest beauty in its purest form.